How would it feel to communicate with more power and excitement? 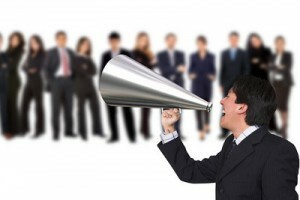 More importantly, how would an audience react to your ability to communicate dynamically and powerfully? Chances are, you would feel more confident and excited, and your audience would be more interested and apt to pay attention. The way a person’s voice sounds in terms of volume, pitch, range and pacing, has a huge impact on the audience and their willingness to follow the person’s message. For example, if a presenter’s posture is slouched over; their voice soft and meek; and their rate of speech slow, the members of the audience will more than likely have a hard time staying focused and enthusiastic during the presentation. Chances are that the presenter will not have made a good impression on the audience. Strong presenters use showmanship in both verbal and physical communication. Dale Carnegie once said, “The truth has to be made vivid, interesting, dramatic. You have to use showmanship. The movies do it. The radio does it. And you will have to do it if you want attention.” If a person is not passionate about his/her topic, why should the audience be excited about it? Often times we listen to someone speak and think, “This is beyond boring,” and believe the person is wasting our time. The next time you are speaking publicly, whether for an individual, small or large group of people, video record yourself or rehearse in front of a mirror. This will enable you to … see things from the other person’s point of view, Dale Carnegie Human Relations principle #17. If you are telling a story, relive the experience exactly as it occurred. Talk about a specific incident and don’t hold back. Paint a picture for the audience by using a lot of action. Project your voice so that everyone can hear and use intonation to stress important points. Stand up straight and smile, Dale Carnegie Human Relations principle #5. Remember that putting action into our business communications helps alleviate stress by releasing nervous energy. This type of behavior can transform a boring meeting into an engaging, profitable one. Did you know that your voice inflection, facial expressions and body language can make up over 90% of your message? By following the aforementioned tips, you will increase the likelihood that your audience will retain your message…and you may just inspire and/or motivate your friends, family and or colleagues to pack power into their communications.